We’ve got them right where we want them. The Giants face a rookie with an ERA of 5.63 and a WHIP of 1.70, in Jared Cosart, a 26 year-old who was beaten by the Rockies in his last start. The former Miami Marlins draft pick seeks his first Major League win against Madison Bumgarner. Madbum makes his first start since the infamous standoff with Yasiel Puig and the Dodgers in Los Angeles. This is not just your garden variety Giants-Padres games folks. This is a playoff game for the Giants. With 8 games left in the season the Giants find themselves one game behind the Mets and tied with the Cardinals, who pummeled the Cubs earlier today, for the Wildcard positions in the postseason. Last night the Giants scored two runs and had a grand total of four hits against Edwin Jackson and the Padres bullpen. In last night’s game the Giants were beaten by a Padres team that sported six rookies, including three call-ups. There has been much to debate concerning the Giants run-scoring difficulties. The only way to go into this game if you are a Giants hitter, is to treat it like the first game of the season. Forget the slump. Forget the frustrations. Just play. How will the Giants hitters fare against yet another rookie? 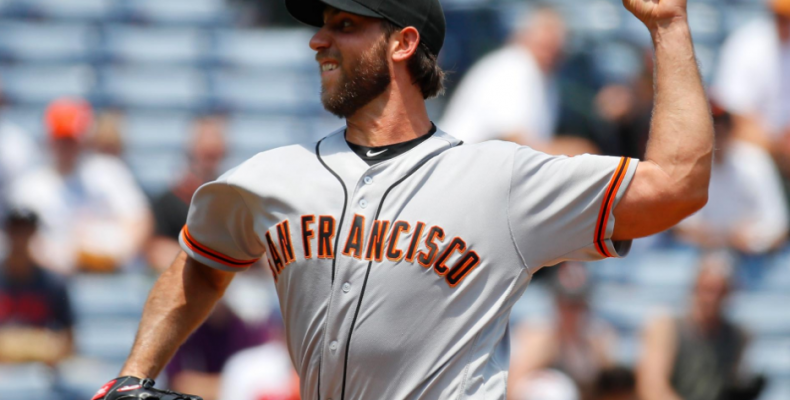 Will the drama of his last start affect Madbum adversely? When will Brandon Crawford return to the lineup? Who will lead the Giants in home runs this year? Happy 28th Birthday Hunter Strickland! May your fastball always zip and your slider always slide!